I’m putting this on the list of things I wish I would have known before baby. I have the clear plastic guards for the front of the crib, but I never bothered with the sides. Charlotte doesn’t spend a lot of time in her crib unless she’s asleep, so I didn’t think I needed them. 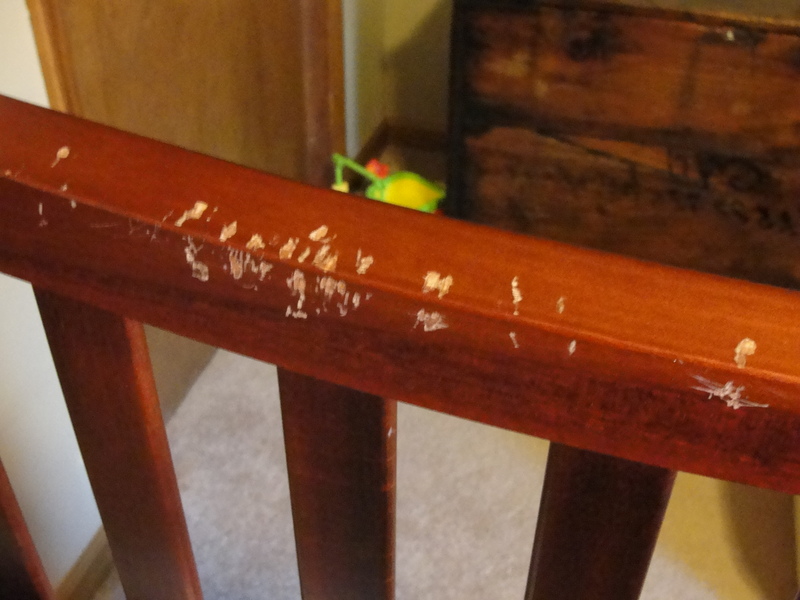 The fact that she has eight teeth and chews on everything really should have clued me in that this could be a problem. A few weeks ago, I walked into her room and discovered this. . .
What. . . The. . . Frick. . . ?! It was like something from a scary movie! 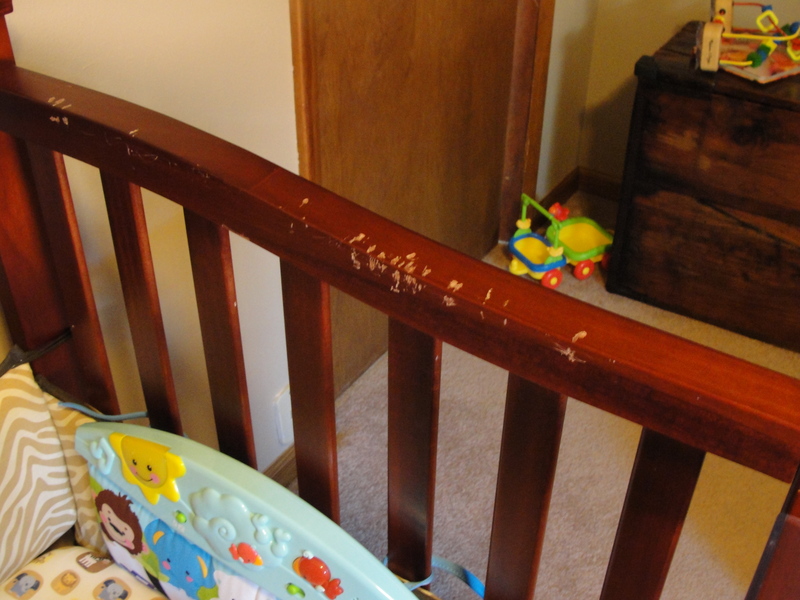 It looks like the crib was attacked by a gremlin. Or an angry beaver. Apparently, I should have bought rail covers. The problem with the fabric ones is that they hang down too far. With the bumpers, the sides would be totally covered – and I’m definitely not comfortable with that. The plastic ones don’t work, because the side rails are too thick. The only solution that I could come up with was to make my own. I can do a lot of crafty things. However, I cannot sew. 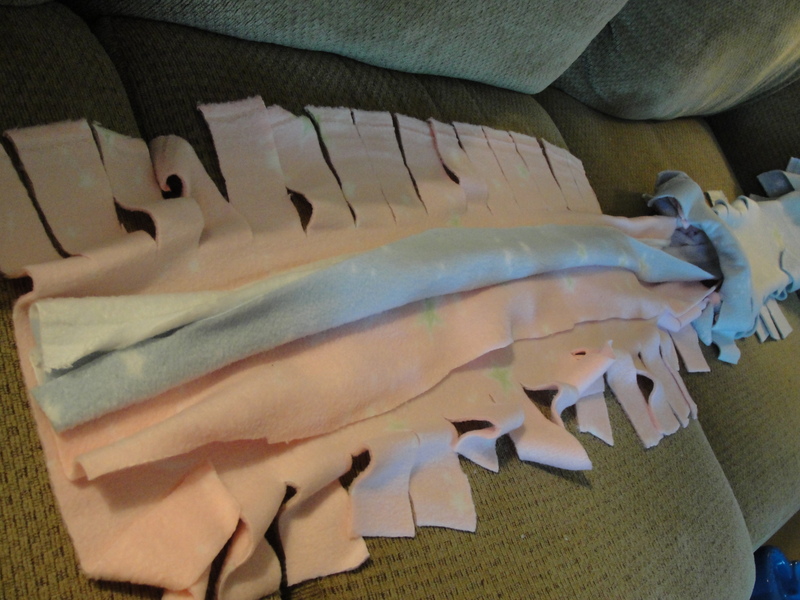 I have made tie blankets before out of felt, so I thought that I might use that idea to basically make two long, skinny blankets to cover the rails. Here are the directions that I came up with. 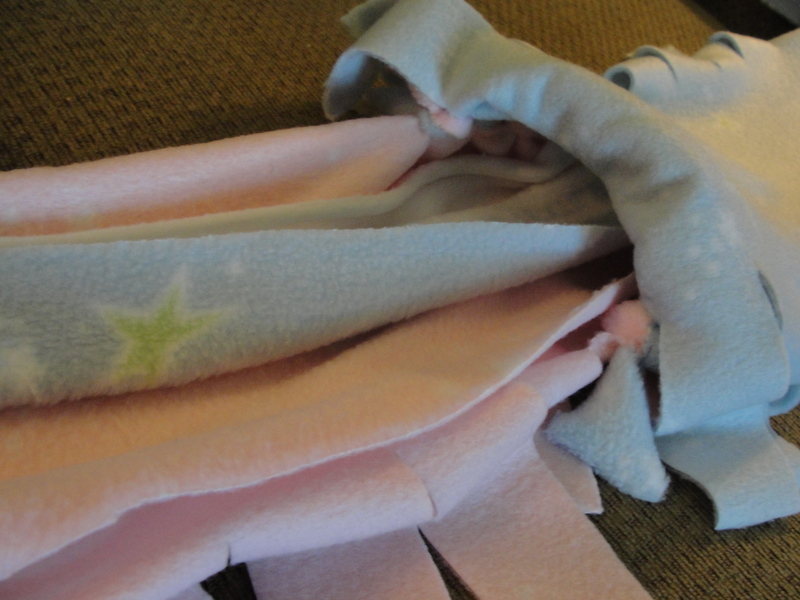 I used two different colors of fabric, so that the cover is reversible. You can also use all one color. 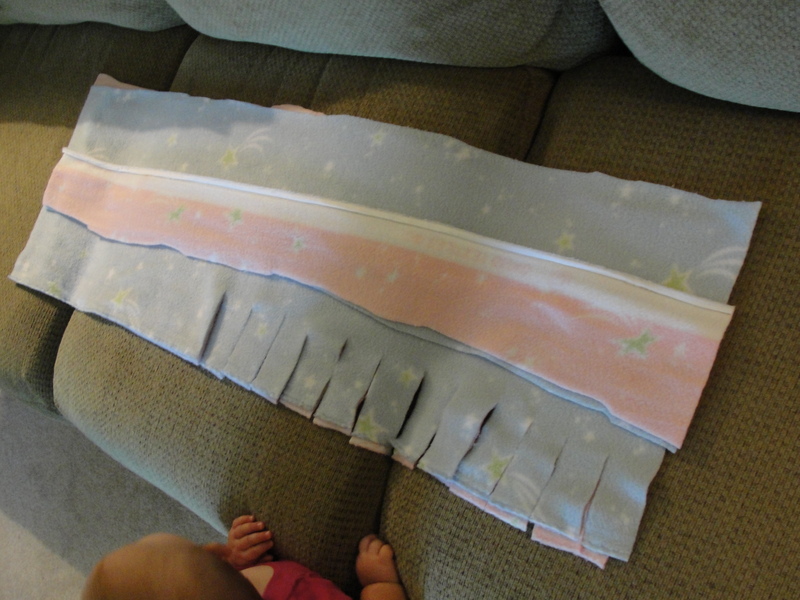 I don’t want to make new ones for baby number two (someday – not anytime soon! ), so I made them pink on one side and blue on the other. 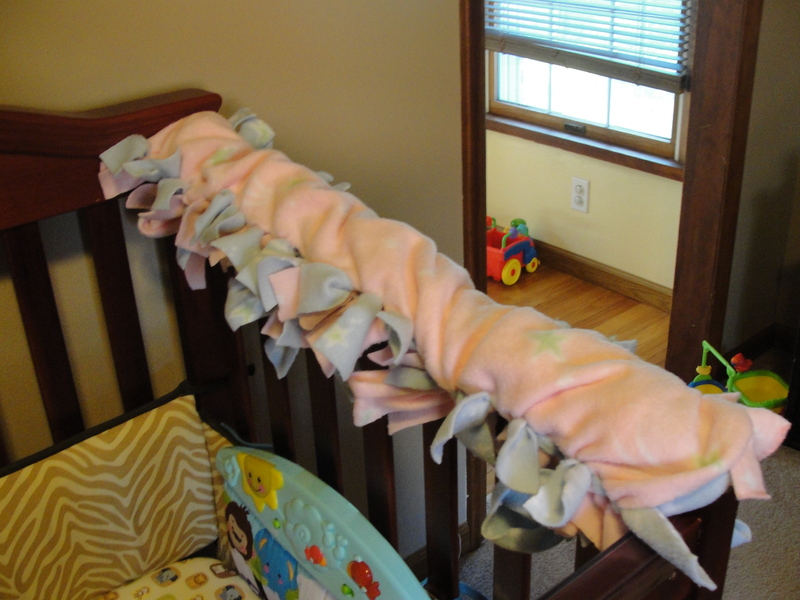 The length of the crib rails are about the length of a bolt of fabric. So, when cutting you can keep this length and just cut the right thickness. These directions are obviously to make one cover, but 2 yards of felt is plenty for two covers. So, when you’re finished – repeat for a pair! Cut a 13 inch piece and a 4 inch piece out of each color. 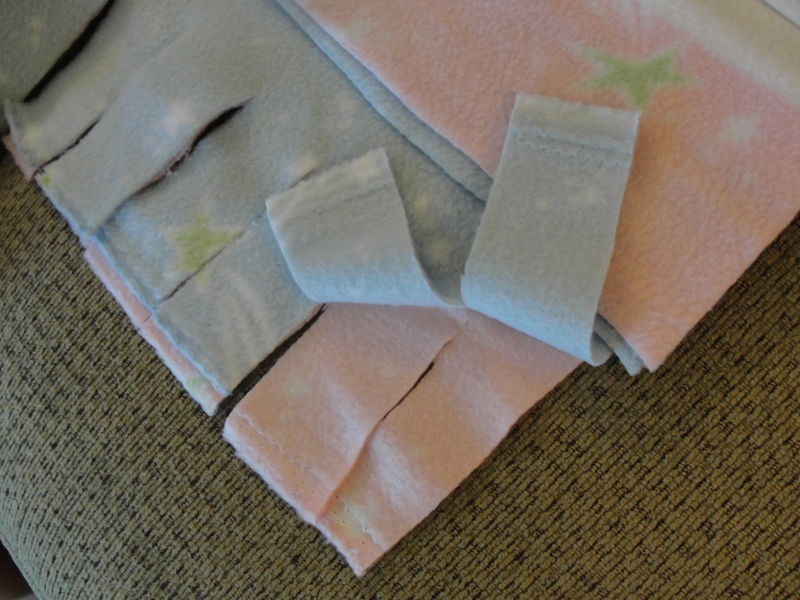 The 13 inch pieces will act as the outsides, while the 4 inch pieces will provide extra cushion in the middle. 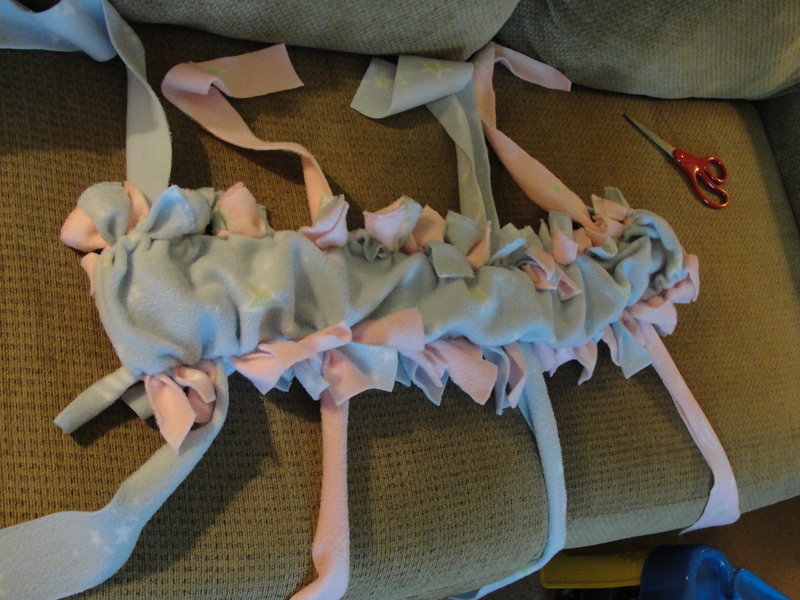 Cut 2 inch thick ties, that run about 3.5 inches deep, down both long sides of the 13 inch pieces. Cut both layers at the same time, so the pieces that you will tie match up together. You will need straps to attach your cover to the rails. 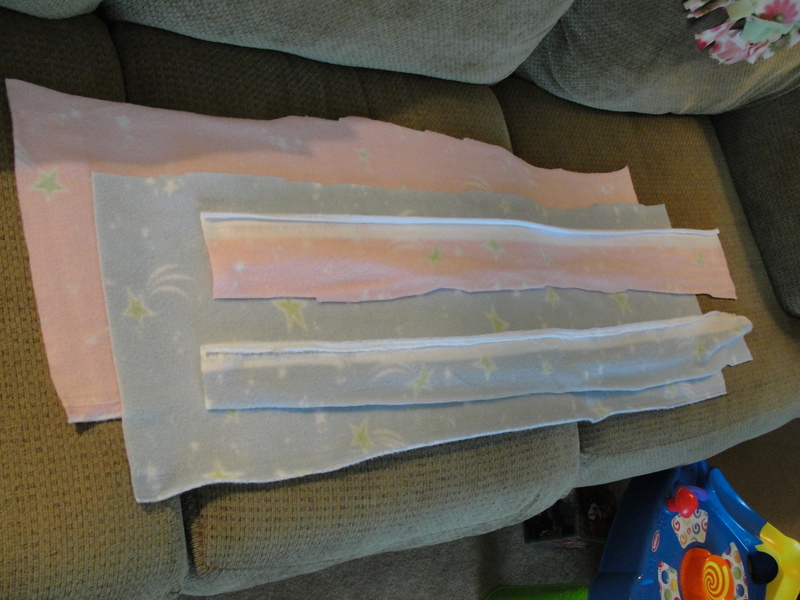 Cut 4 pieces that are 3 inches wide – 2 from each color. They look really long, but you’ll need the length to tie them to the rails. 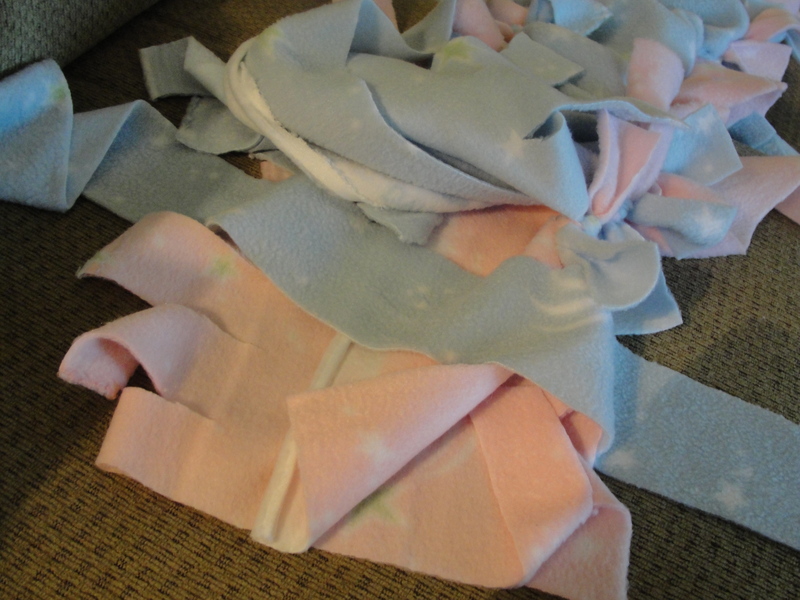 Stack your fabric so that the 13 inch pieces are on the bottom and top, and the 4 inch pieces are in the middle. Start tying at one end of your cushion. Again, the bigger (13 inch) pieces go on the top and bottom, while the smaller (4 inch) pieces get sandwiched in the middle for extra cushion. Step Five: Make Sure to Include the Straps! You need to evenly place your (4) straps that you cut in Step Three while you are tying the smaller pieces. 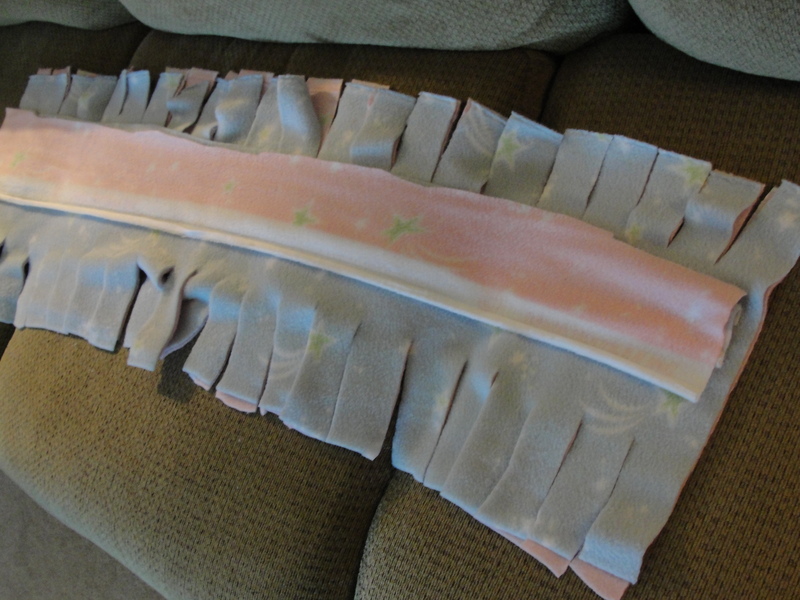 I laid the straps 6 inches in from both sides (or 3 ties in), and then evenly placed the other 2 straps in the middle. Don’t tie anything to the straps. They are laced through, but not tied to the bigger pieces. Position the cover on the side rail, and tie the straps. I tied them into a bow, which Charlotte has not managed to get undone yet. You can always tie them into a knot if this becomes a problem. I love the covers – I just wish I would have thought about doing this before Charlotte chewed up the rails. . .
What do you wish you would have bought/made before baby? I would love to hear about any projects or ideas! 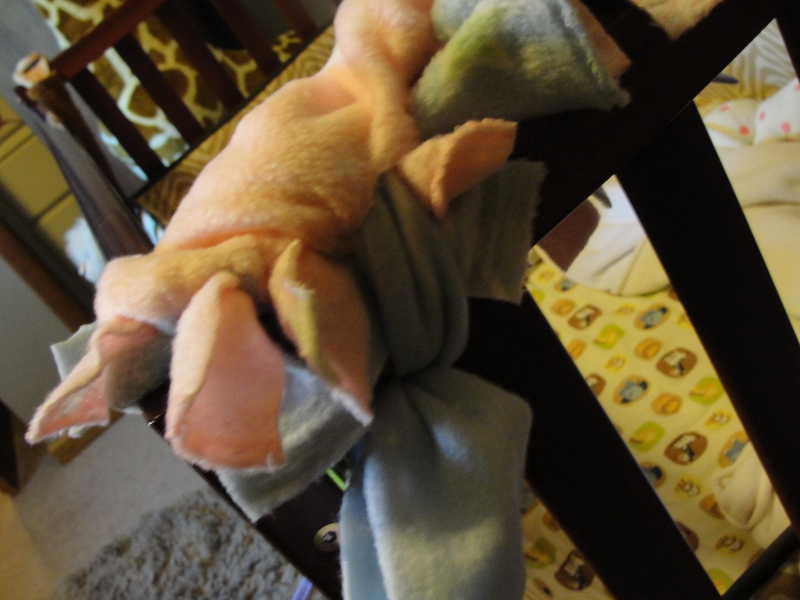 Posted in Get Crafty and tagged Crafts, Crib Rail Covers, safety, Things my kid ate. Bookmark the permalink. 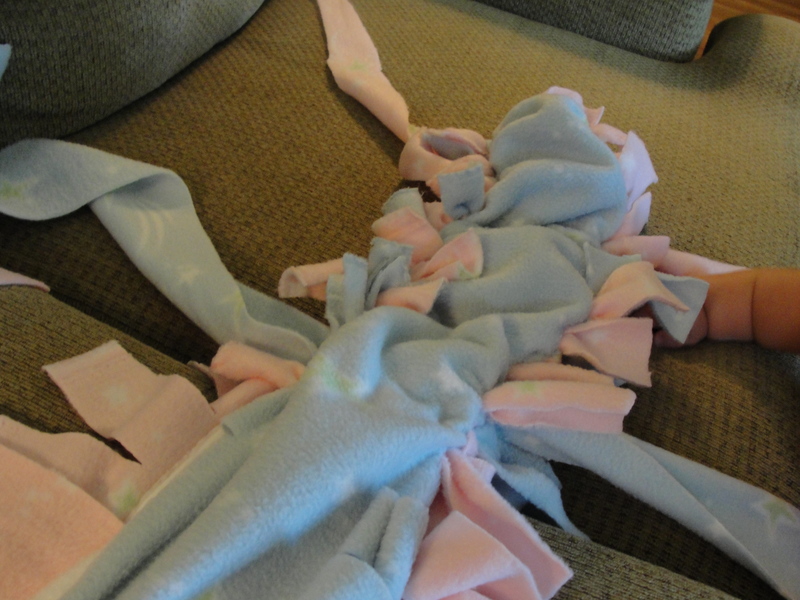 I make tie blankets all the time but never thought to do this! Looked just like yours, too. Still makes me laugh! He was so quiet–it happened after he woke up…that little stinker! Now I tell ALL of my friends about getting rail guards! If I could do this again, I would have purchased the whole set of matching cloth rail gaurds. 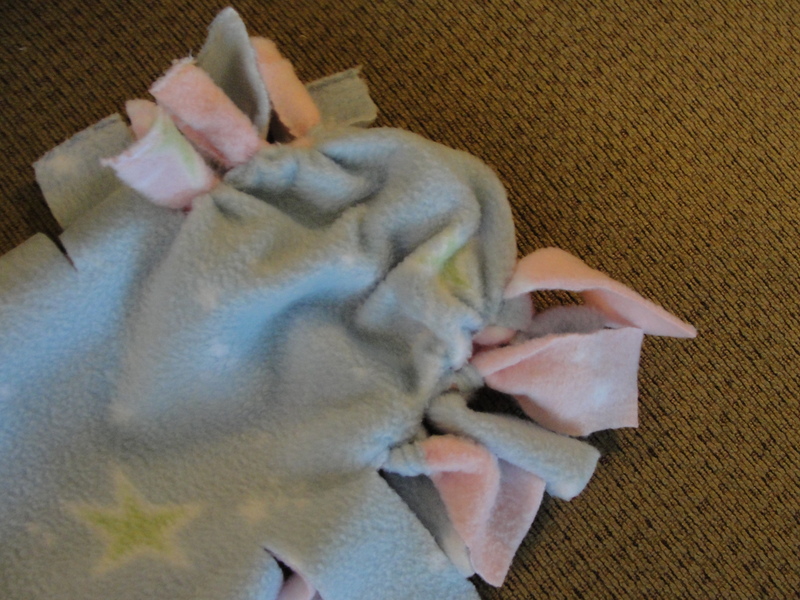 The fleece tie on kind is harder to remove for washing. Do you have the straps knotted or just tied in a bow? Ours are tied into bows, and it’s super quick and easy to untie the straps for washing. After she figures out how to untie them and we have to knot them – That will be another story! Good suggestion to use bows. Last time I only had enough length to TIE them on, but for the next baby I should make them again so I can bow them on. 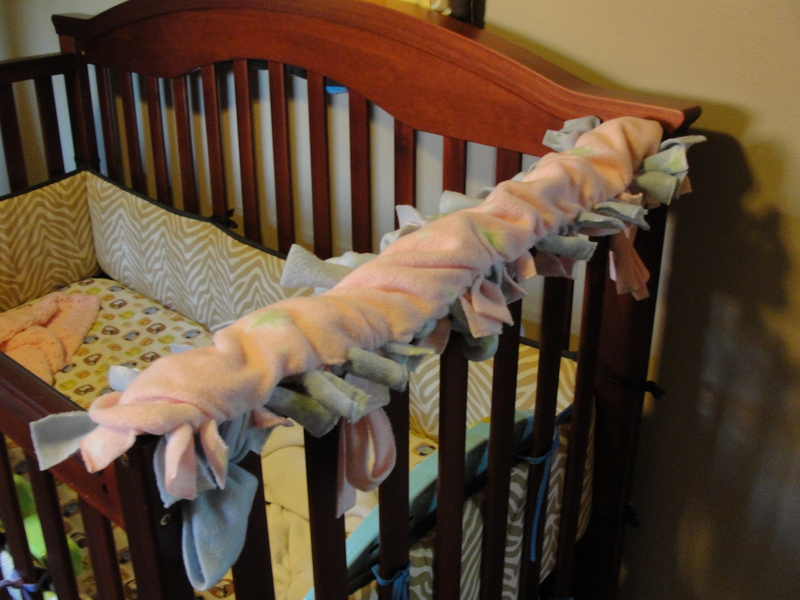 I would still do a double knot on the outside of the crib and try it. We have to double knot or cloth railing gaurd in the front and it was never an issue.